Impaired Driving–Drunk driving is a serious problem that continues to take thousands of deaths each year. Too many lives have been lost to drunk driving. A death from drunk driving does not only affect the victim but it affects everyone around them such as family and friends. One night, one drink, one mistake is all it takes for drunk driving to take its toll. There are many solutions to prevent drunk driving, but they will only work if we put them into play. 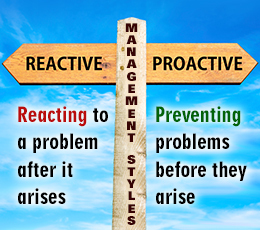 What does it mean to be “proactive”, as opposed to “reactive”? And how can we do it? The word “reactive” implies that we don’t have the initiative. We let events set the agenda on how and when we “react”. Each new event catches us by surprise. Quickly and vigilant, we scramble to react to it in order to deal with it. In contrast, the image we associate with “pro-activity” is one of grace under stress. It would be great to deal with catastrophic events as they happen however this comes at a huge cost both financially and with the loss of human lives. Being proactive is not a gift only for those people who are endowed with a proactive attitude (or, maybe, a “proactive gene”)? In a nutshell, being proactive is the same thing as being reactive. The only difference is: we all put in the effort to do the reacting ahead of time.